After a tree removal, the stump is often left in the ground. Specialized equipment must be used to “grind out” the remaining portions of the root flare and stump. Typically, we recommend grinding down the stump to about 8″ for the establishment of turf grass over the site, deeper levels of grinding can be arranged if required. 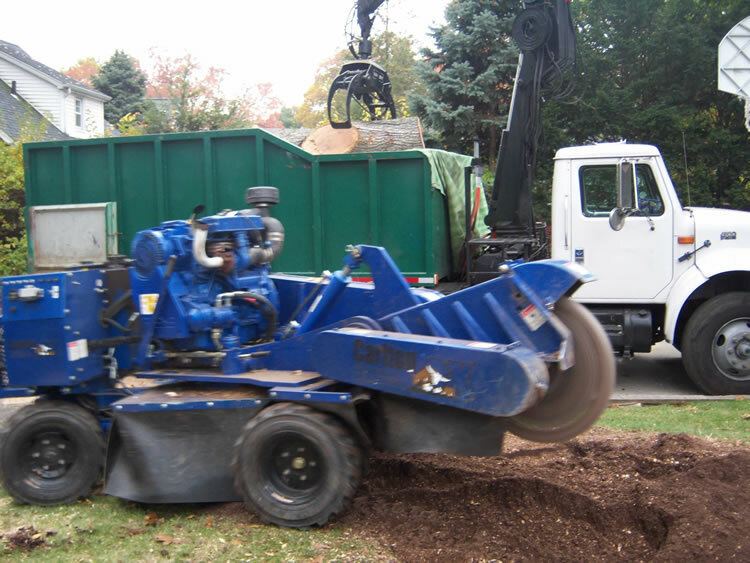 Using state of the art stump grinding equipment allows us to complete the task correctly the first time. Our machines fit through standard 36” inch backyard gates, making it easy for us to reach stumps in backyards. After our stump grinding services have been completed, we use the tree stump mulch compost produced to level the ground. On deeper stump grinding services, we backfill the hole for safety reasons. Any compost produced from old stumps can also be used as mulch for your flowerbeds or it can be hauled away by our employees for an additional cost.